Elissa Goodman offers common-sense, natural, and holistic "hacks" for fighting cancer. After being diagnosed with cancer when she was thirty-two, Elissa Goodman explored holistic alternatives and combined them with traditional treatments and was able to beat the disease. Her husband wasn't as fortunate; he succumbed to Non-Hodgkins Lymphoma when he was only forty-five after a regimen of doctor-prescribed chemotherapy and two bone marrow transplants. Her personal experience led her to realize the many ways in which nutrition and lifestyle affect our ability to deal with health challenges. 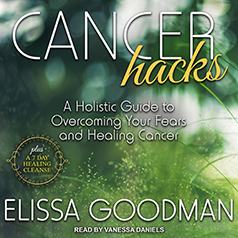 In Cancer Hacks, Goodman has put together a comprehensive plan designed to offer some common-sense, natural, and holistic advice to deal with the fear and uncertainty so many people face when confronted by this terrible disease. The various "hacks" described in the book are intended to help those dealing with cancer, or those whose loved ones may be facing the battle. Her suggestions are practical and easily incorporated into day-to-day living. Also included is a seven-day cleanse regimen for those looking to reset their bodies and refocus their energies on a fuller and healthier lifestyle. You can’t view any supplemental PDF materials before you buy Cancer Hacks. If you purchased it elsewhere, please enter the access code provided in the beginning of the audio to view the supplemental material. All access codes should be entered in lowercase letters. PDF software is required to view the supplemental PDF.